I recently posted one of my favourite spicy recipes Chicken Korma. Now I am the first to say (as I did) that my camera skills can be rather, shall we say, marginal at times! There are some recipes that well, just look blah on the plate. Tasty in the tummy though. Now if I had added a few beautifully coloured vegetables, or even a tiny bit of garnish things may have looked better. Anyway, I have just found the perfect accompaniment to the Korma. This simple but tasty looking (better camera skills! ), recipe from Devika’s Kitchen, I think will be a perfect addition to Chicken Korma! 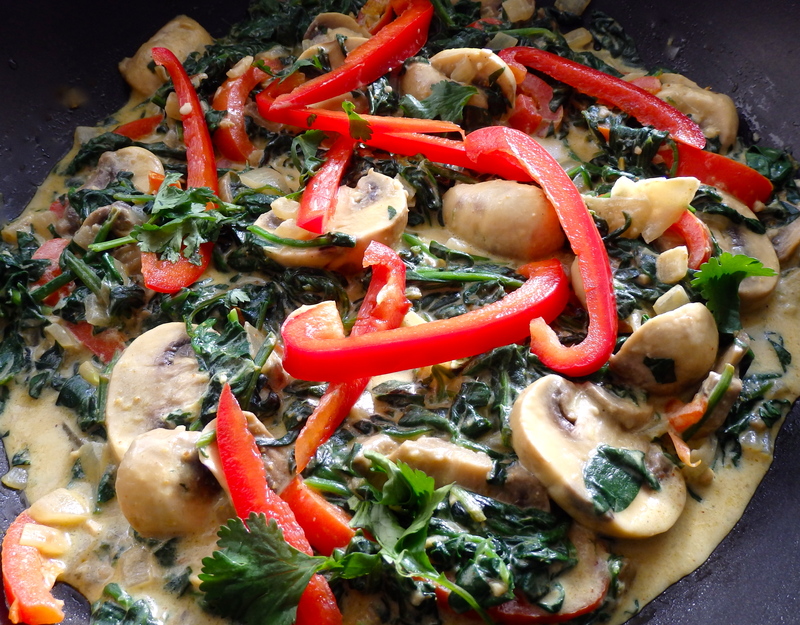 Devika’s Kitchen Spinach with Mushrooms and Red Peppers. Heat oil in a wok or frying pan and fry the onions and curry leaves and onion seeds for 1-2 minutes. Add the garlic, ginger, chilli powder, salt and ground coriander. Fry for 2-3 minutes. Add half the red peppers and mushrooms and continue to fry for 2-3 minutes. Add the spinach and fry for 4-6 minutes, then add the fromage frais/cream fraishe and fresh coriander, followed by remaining red pepper slices. Fry for another 2 mins before serving, garnished with coriander leaves. Make sure you head over to Devika’s Kitchen and enjoy the other recipes there. As she says “Life is only as delicious as we make it”.